This is the new look for presidential Family portrait. 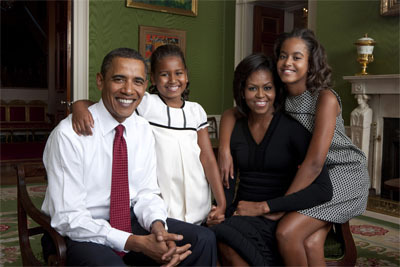 The first family photo was release to the media via Flikr. the family portrait was taking on Sept. 1, 2009 in the Green Room of the White House by celebrity photographer Annie Leibovitz. however the question Still remain, where the first dog Bo? Marc Anthony performs to a full house at the America Airline Arena in Miami. He was also joining on stage by NBA Player D-Wade and his new team mate from Puerto Rico Carlos Arroyo to present Marc Anthony with a Miami Heat jersey.